Treasures of the Diocese of Szombathely 2. DIOCESAN COLLECTION AND VISITOR CENTRE „JÁNOS SZILY” TICKETS AND PRICES. THE BISHOP’S PALACE CAN BE VISITED ONLY BY GUIDED VISITS. The Cathedral of Szombathely was crowded with people on the 12th of November when István Császár the governor of the Diocese has completed the Jubilee Year. You are cordially welcome to the Saint Martin Meeting in Szombathely! The Hungarian Catholic Church, the Diocese of Szombathely and the County City of Szombathely celebrates in 2016 the 1700th anniversary of Saint Martin’s birth. You are most welcome to the Diocese of Szombathely and to the city of Szombathely in this Jubilee Year of St. Martin. Learn more about the center of the Diocese and about the city where St. Martin was born. Visit his birthplace in the church named after him and enter the visitor’s center. Have a look at the Cathedral, go for a walk on St. Martin's Way in the town. 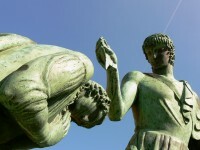 Get to know St. Martin, learn more about Szombathely. 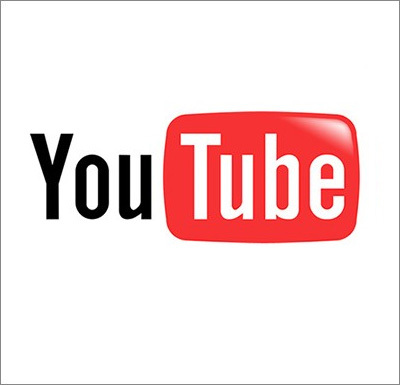 You can find detailed information about sights and contact information on our website where you can also download these materials. The Diocese of Szombathely and the Abbey of Pannonhalma organize several common programs in this Jubilee Year of St. Martin thus expressing their respect towards St. Martin and show an example of community and cooperation. The first common event was the Family Meeting on 2 April. In 2016, Hungary is celebrating a double-jubilee: the extraordinary Holy Year of Mercy, established by Pope Francis, is joined by the celebration of the 17th centenary of the birth of St Martin. Indeed, in the year 316, the territory of present-day Hungary was the birthplace of Martin, perhaps one of the world’s most well-known saints, thanks to the the event in which he took the cloak off his back and shared it with a beggar. – news of L’Osservatore Romano March 1, 2016. "Everyone should have a cloak" is a charitable movement started recently in Szombathely. The 10th of February was Ash Wednesday, the beginning of the Lent. Christian faithful prepare with this 40 days period for the feast of Easter, Jesus' resurrection. The parish community celebrated the church’s 200 years anniversary in Alsószölnök on the 13th of December. Dr. András Veres bishop of Szombathely celebrated the Holy Mass on this occasion. The German and Slovenian speaking community has given a concert on this important day. The main entrance of the Cathedral was renewed for the St. Martin Jubilee. The new gate was blessed by bishop András Veres on the 13th of December on the same day of the opening of the Jubilee of Mercy. The bronze gate will be the gate of mercy in the Diocese during this Holy Year. 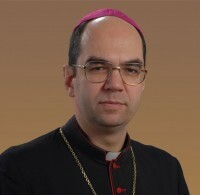 Bishop András Veres opened the St. Martin Jubilee Year. Next year we will commemorate the first non-martyr saint of the Church who was born in Szombathely. The exterior and interior renovation of the St. Martin Church took several months. Thanks to these works a new environment receives the pilgrims coming to the chief town of Vas county. The Madonna Chapel, opening from the northern transept of the Cathedral of Szombathely was completed in 1800 and it was originally named St. Michael's Chapel. The statue of the Madonna was given as a gift in 1928 by a count and countess to the then bishop János Mikes. In 1945 the chapel was fortunately spared air raids, therefore the Cathedral maintained its original Baroque and Rococo era frescos of unique value. The determining fresco is the one on the ceiling of the Chapel portraying the Last Judgment. The side wall depicts Jacob's dream. A relic of St. Martin was enshrined on the 24th and 25th of October in St. Elizabeth's Church of Körmend. On the 25thof October, the 145th birth anniversary of Blessed László Batthyány Strattmann a thanksgiving Holy Mass was celebrated in commemoration of the doctor who had his eye clinic in the city of Szombathely. Caritas staff were awarded by a prestigious prize in Budapest. Mária Csiszár (Zalaegerszeg - Our Lady's Immaculate Heart Parish), Mária Pulay and Tivadarné Rába (Jánosháza - St. John the Baptist Parish) were awarded the CARITAS HUNGARICA Prize. On October 16, a new exhibition was opened in Szombathely in the Baroque hall of the Diocesan Library. The hall was built 130 years ago. The exhibition presents the works of construction. requested the help of our Lord in their common prayer to guide their life in the purity of the heart. Many young people from other cities across the country and also from abroad prayed with us simultaneously. 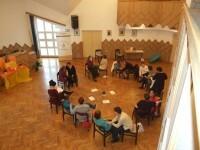 I’ve got time for You was the title of the mother-daughter weekend in the Martineum Academy for Adult’s Training. The participants breaking out from their family surrounding and the everyday hustle-bustle, were playing, talking, doing all sorts of feminine activities, thus building and strengthening the love relationship between each other.